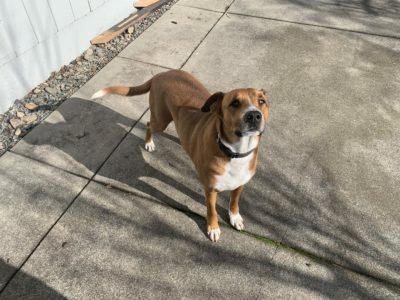 Pet’s Breed: Boxer shepherd mix? I came home one day to find this beautiful dog I named Kuma in my yard. He was clearly very abused so I called the local authorities and they told me that if they came and got him the owners had 4 days to claim him or they would put him to sleep (I was working in the Central Valley at the time). He is a sweet boy and did not deserve that so I paid to get him checked out and neutered by the local vet. I can’t keep him where I live because we already have two dogs and that is the max we are allowed in this community. Kuma needs a loving family I don’t think he would be good around cats and he needs some work because he is very fearful of the outside world and not used to the leash yet. The perfect home would be a family with a big yard for him to run and play in but he also likes to be inside so he can cuddle with someone that will love him. This dog had a very rough beginning to his life and needs a understanding loving family. He is house broken neutered and has had his shots please help me give this beautiful animal his forever home. I am willing to foster him until that is found and work with anyone interested to be sure it is a good fit.